We’re not just an online news magazine. We are not just a business magazine. We are not just an investment magazine. We are not just a lifestyle, sports or entertainment magazine. We’re all that...and more. More ideas, more news and more entertainment for Oregon and the Pacific Northwest. Frankly, Brainstorm NW is more of what you are looking for to stay fully informed. So get smart. Bookmark Brainstorm NW! Brainstorm Ideas: Get beyond humdrum daily headlines and into the future of ideas, right and left, pro and con. If you’re swimming in information, but starved for intelligent analysis and ideas, in-depth, thoughtful commentaries are just one click away. Follow Brainstorm NW on Twitter for more ideas, more news and more entertainment. We welcome you to share your thoughts and ideas on our Facebook page and read what other viewers have shared. Lowest Gas prices in Portland, Oregon: Find the gas station nearest you with best gas price! Explore these interesting Brainstorm Videos. It doesn't get any better than this! The city famous for Cape Kiwanda, Nestucca River, Haystack Rock, the Dory Boats, and so much more. Have you ever wanted to walk across the bottom of the River, Lake or Ocean to see all the ships that have sunk? Do you like beer? Here is a list of all Oregon Breweries. Oregon is famous for great breweries. Go here if you are looking for the best free online percentage calculator. The Oregon Coast is the most beautiful coast in America. Check out this guide for all its beauty. Sharp contrasts and unique lifestyles distinguish mountains, coast and high desert in Oregon. Pictures and information about interesting natural wonders on earth and beyond. Valeur believes knowledge is the indispensable tool to success. Do you know what Yolo means? Learn more about YOLO here. 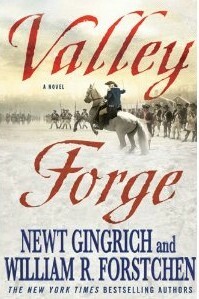 Valley Forge: George Washington and the Crucible of Victory Writing team Gingrich and Forstchen follow up the success of To Try Men’s Souls (2009) with another novelization of a seminal episode in the history of Revolutionary-era America. Once again, George Washington provides both the narrative focal point and the moral core of the story, as he and his fledgling Continental Army struggle to survive the bitter winter of 1777 at Valley Forge. Are you an Automobile fan? Lots of cars and trucks information here. All about numbers. Calculate this, calculate that. Fun and interesting online calculators. Do you need a laugh? Check out these funny and interesting jokes, riddles and more. Do you collect things? Do you hoarder? Nice collections here! More ideas, more news and more entertainment for Oregon and the Pacific Northwest.